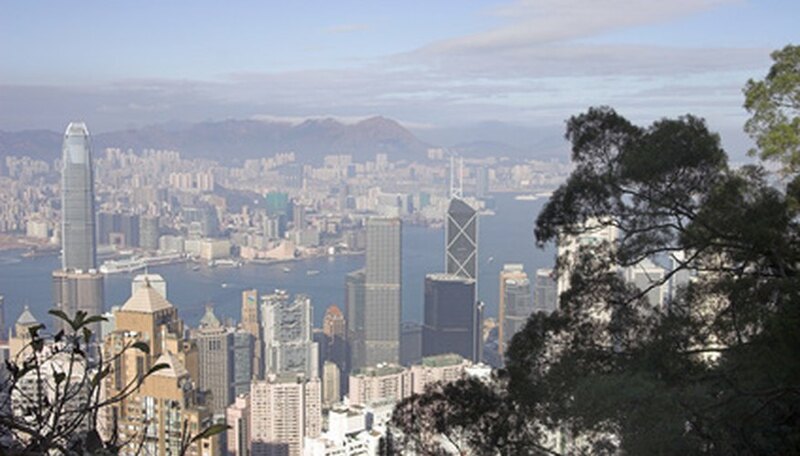 In some ways, Hong Kong combines the best of both Western and Chinese culture -- it was under British rule for many years and reverted to Chinese rule in 1997. Hong Kong is a modern city bustling with people and offering many activities and attractions including regional cruises and a Disney theme park. Hong Kong offers opportunities for romantic dining. Petrus, located in the Island Shangri-La Hotel, is 56 floors up and offers a spectacular view of Hong Kong’s skyline and harbor. Live piano music sets a quiet, relaxed mood with a menu of French dishes. Recommended by Frommer’s as the best spot in Hong Kong to enjoy a romantic dinner, Petrus is bedecked with soft-glowing crystal chandeliers, cloud-painted ceilings and large windows. Two private rooms are available for private parties or couples. Located in the Wan Chai region of Hong Kong, the OVOlogue offers Cantonese cuisine in an elegant, relaxed atmosphere. Balconies, columns, French windows and high ceilings supported by sturdy wooden beams combine with traditional Chinese arches to create a historical setting. Recommended by Fodor’s as one of Hong Kong’s most romantic restaurants, OVOlogue is set in one of Hong Kong’s few remaining colonial buildings and features 1920s Shanghai-style decor. The menu includes dim sum and a selection of Cantonese dishes such as braised beef in Sichuan hot sauce or stir-fried wild mushrooms in truffle oil. The Pearl on the Peak offers Australian cuisine atop one of Hong Kong’s most popular attractions -- the Peak, a mountain on the island. The restaurant offers a 270-degree view of the city below through floor-to-ceiling windows. Chef Geoff Lindsay and the Maxim Group teamed up to create the restaurant that features dishes such as mother of pearl meat fried with shitake mushroom and tiger prawn with scampi custard. The restaurant has 11 window seats. Expect to pay for the view -- as of 2011, the average price is $500 per person for dinner. This restaurant was named by Fodor’s as one of Hong Kong’s finest for lovers. Schmoll, Nicole. "Romantic Restaurants in Hong Kong." Dating Tips - Match.com, https://datingtips.match.com/romantic-restaurants-hong-kong-7790960.html. Accessed 19 April 2019.